If we were having coffee, I would greet you with enthusiasm as it has been a couple of weeks since I last shared my news. Last weekend I was not feeling well: I had a stuffy head and runny nose. Not pleasant at all. My lack of enthusiasm to do anything translated into two days of rest and lying down while reading my current novel. I do admit that I loved it! 🙂 The rest did me well and now, a week later, I am back to my normal self. If we were having coffee, I am sure you would ask me how my presentation to the staff on documentation went. It went well and a lot better than I expected. My co-teachers listened respectfully to what I shared and many worked seriously on creating their own form of documentation in the time we gave them to practice. My hard work was appreciated when I passed on the mini-booklet I had created for them to keep. I am hoping that it is not tossed in a drawer but is used to help them using Google Docs and the iPad to document their students’ learning. If we were having coffee, I would tell you that this week has been ultra busy. I have seen all the parents of my students for the interviews at which we discuss their child’s progress. To accommodate the parents’ working schedule, I offered early morning slots as well as times in the late afternoon/early evening. I enjoyed connecting with the parents and I hope my suggestions are taken to heart. During the past week I also had an opportunity to go on a workshop. The title? Mentoring Conversations. Yes, this year I am a mentor to one of the new teachers in our school. He is a second year teacher and this year he is teaching the same grade combination as me – a class of both grade 1s and 2s. It was nice to be out of the classroom and be the one learning. And the bonus? Getting to know my mentee a little more. Yesterday was a PA day – which meant no children at school. 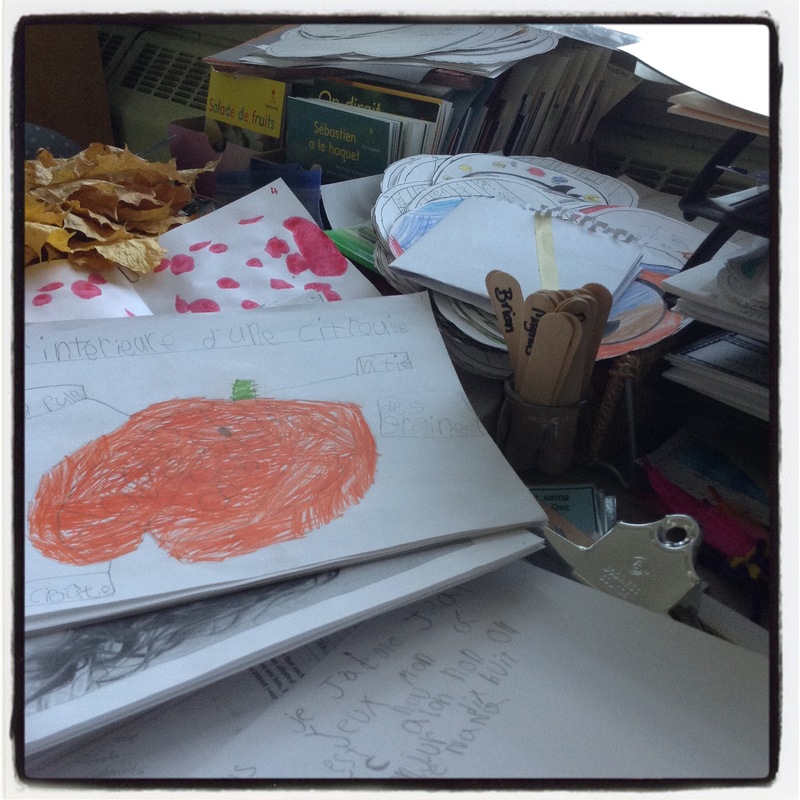 As I had finished all of my parent interviews, I spent some time clearing my desk of my marking, filing, and documentation. No, I did not manage to complete all I had set out to do. I did make some inroads however. Hopefully next week I will manage to catch up a little. As the weekend pans out, I look forward to doing a couple of things with my family: lunch to celebrate my husband’s birthday, and watching my daughter participate in the Santa Parade. I hope you have enjoyable events planned for your weekend. Have a wonderful two days of rest. Thanks for the coffee and chat!! I would have a similar story. I didn’t have interviews but I did spend a lot of time organizing finished art work and putting it up in the hallways for parents to admire. I also cleaned up the library to make it presentable for our visitors from the Netherlands. In the end they spent very little time in each classroom but they did take notice of people’s efforts to highlight some of the things that we do around here. I’ve also been processing hundreds of new books that I purchased during the book fair and from the vendor’s fair at the Queen Elizabeth building. I got the books for the Forest of Reading labelled and put on display so that we can start our book club in the next couple of weeks. Just when I was starting to see the light at the end of the tunnel a kind parent donated 3 large boxes of books for the library. Thanks for the coffee. I love the libraries in the schools – especially a well=run one (and it sounds like yours is). I am sure the children appreciate all your hard work even though they don’t realise what it takes to run a library. I know that my class enjoys visiting the space where they can browse for books and read to their heart’s content. I would say “do you have any tea bags and honey per chance?”. I don’t drink coffee, but I would like to meet you in person one day! Teaching a teacher younger than you is cool. I enjoy mentoring interns in our office also! Thanks for coffee, Colline. Glad to know you are feeling better. have a great week ahead.